Ever since I read Lauren Conrad – Style, last year I’ve been thinking more and more about the concept of a capsule wardrobe and how I could achieve something similar. As an ironic example of my level of excessive purchasing I have since been unable to locate said book as it is probably residing in a suitcase or under a pile of books somewhere (is there such a thing as a capsule bookshelf? I think I might need one). Further evidence came to support this notion when I read Gala Darling’s article on ‘Why too many choices make us miserable‘, which, if you ever had one of those mornings where you’re getting ready for work and you end up trying everything in your wardrobe on before declaring that you hate everything you own and hiding under a quilt, you might be inclined to agree with. In the years prior to now (as I’ve mentioned several times on here) I generally adhered to a ‘quantity over quality’ attitude to shopping, the result of which is a wardrobe crammed to the rafters with dresses from Primark circa 2009, things that don’t fit me anymore and things I’ve never worn. I think we all have those things in our wardrobe that we skim past when looking for something to wear because we know they’re unflattering, uncomfortable or just plain uncool. 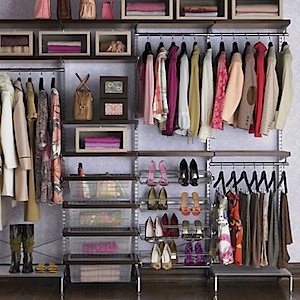 What percentage do those items make up in your wardrobe? I’d say I’m at about 80% (or was prior to my clearout). I recently yanked everything out of my wardrobe and pulled out five giant Ikea bags’ worth of things I didn’t wear. Surprise, surprise, the things I don’t wear are almost entirely Primark or H&M – things I bought because they were a bargain, or because for £3 it didn’t matter that I only kind of liked them. My new approach to shopping is to identify where the gaps are in my wardrobe and buy one item now and then that’s good quality and will work with lots of other items. So I’m slowly building what one might describe as a capsule wardrobe, although achieved in a way that breathes life into other loved items that need a friend they can go out with! I think a capsule wardrobe is personal to the person – for instance a cashmere jumper may be very chic but I rarely wear jumpers! An amazing pair of jeans I’d say is a must-own, but if you’re not a trousers person I’d say it’s probably a no-go and you should invest in a killer dress instead. The things I wear endlessly that are staples of my capsule wardrobe are; pair of ballet pumps, pair of ankle boots, plain t-shirts, high waisted skirt, pair of jeans, pair of leggings, pair of skinny black trousers, blazer, shift dress, cardigans, tights and blouses. One question I have for you is, how much does blogging and reading blogs feel at odds with the concept of a capsule wardrobe and ‘less is more’? Do you think there’s pressure to post about new things and keep up with new season styles (along with temptation from wishlist posts)? I think I’m going to have to get more in the habit of, when I buy new things, old things have to go, though I’ve never been one to clear out things as they go out of fashion. But this is one habit I want to keep to – no more coathanger wars and reams of unworn Primark clothes for me!